No one ever anticipates the need for a real estate lawyer, but life can be unpredictable, especially when buying, selling, and leasing property. If you’ve found out that there were hidden problems with a property you recently purchased in Dallas, if you’re having issues with your mortgage broker or lender, or if you’re stuck in an ongoing dispute with a renter, then it might be time to consider legal representation from an experienced real estate lawyer. Here are some interview questions that can be used to ensure that you hire an attorney that will provide honest, reliable assistance. Becoming a lawyer requires a lot of schooling and the ability to pass the bar exam, so all practicing attorneys should be qualified to handle your case, right? Not necessarily. Unless you ask how long they’ve been practicing real estate law, how will you be able to tell whether or not they’re a seasoned veteran or fresh out of law school? Keep in mind that not all legal services require 20 years of experience, but it’s always good to know what you’re working with. It’s reassuring when an attorney feels confident that your case can be resolved with a favorable outcome. But it’s not enough just to tell you that they can, they should also be able to tell you how. Before hiring anyone for legal services, ask for an expected timeline of what will happen when, so you have a good idea of what to expect. How Will The Fee Be Handled? Are you searching for a reliable real estate lawyer in the Dallas area? 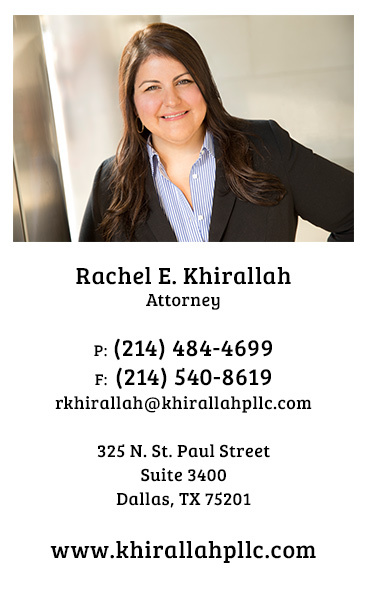 Khirallah PLLC is ready and willing to answer all of these questions, and more. Contact us today!